Marinade: In small bowl, combine marinade ingredients and mix well. 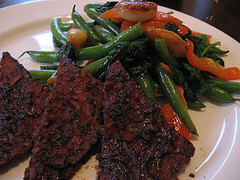 Tempeh: Place tempeh in a shallow bowl and pour marinade over it. Cover and refrigerate several hours or overnight, turning occasionally. Drain tempeh and reserve marinade. Cut tempeh into 1/2-inch cubes. Coast bottom of large nonstick skillet with cooking spray and heat over medium heat until hot. Add onion and bell peppers and cook, stirring often, until just tender, about 5 minutes. Add marinade and all remaining ingredients except salt and pepper to skillet. Bring mixture to a boil. Reduce heat and simmer, uncovered, until mixture thickens, mashing cubes of tempeh slightly with a fork. Season with salt and pepper.